In october we wrote about our long anticipated face serum – done with testing and ready for production. And as we are a few days away from day one of production, we are told that one of the commodities are not ready for delivery yet. Of course we do not want to compromise and replace with a more accesible commodity, so we have to be patient and be happy that it is only a couple of weeks delay. So – what is it that we are waiting for? It is the organic and ECOCERT-certified Sour Cherry extract. We have chosen exactly this one as our high factor ingredient for our face serum, as it will help boost the activity of anti-aging, tighten lines and stimulate the collagen production in the skin. So it is really worth the wait. Psst! Also remember the content of hyaluronic acid and vitamin c completes our face serum. It gives amazing hydration and leaves you with the softest skin. So get excited for the Face Serum Botanical PURE – available in the webshop week 4, 2019. If you want to be sure to get a Face Serum from the first production batch, then keep reading. We are selling the first 100 Face Serum bottles prior to production. 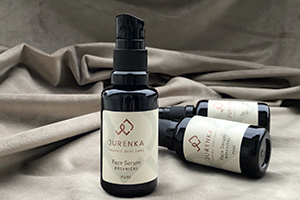 As of thursday the 6th december 2018 you can buy the Face Serum PURE in our webshop. And your purchase withdrawal will first be done when the Face Serum is ready to be shipped. In week 4.